Many gardeners are concerned about helping to support insects that pollinate plants, especially the monarch butterfly (Danaus plexippus) due to its continuing decline. In this article, we will cover the many ways that gardeners can help monarch butterflies. The Xerxes Society for Invertebrate Conservation reports that only 200,000 monarchs were observed overwintering along the California coast during the 2018 monarch count last winter. Twenty years ago, Xerxes adds, that number was 1.2 million. One major reason for the decline is the loss of milkweed (Asclepias species) in farm fields throughout the monarch butterfly’s range from Mexico to Canada. Once considered purely a nuisance weed in agriculture, milkweed has become scarce in farm fields due to the use of the herbicide glyphosate that kills weeds but not crops genetically modified to withstand the chemical. Fortunately, there are many ways home gardeners can help monarch butterflies and other insects that make food and flowers possible by spreading pollen from one plant to another. These actions include planting plentiful milkweeds and nectar plants, becoming aware of predators, and using chemicals carefully in gardens. Milkweeds produce nectar loved by many pollinators, including bees, beetles, butterflies, hoverflies (they look like tiny bees), and moths. Monarchs drink milkweed nectar. However, the plants are particularly important to them, because milkweeds are the only plants on which monarch butterflies lay eggs. In addition to food, all butterflies need host plants for their babies. The U.S. Department of Agriculture Plants Database page for milkweeds (Asclepias L.) includes distribution maps of 76 kinds of milkweed either native or common (“introduced”) to parts of the U.S. To see the maps, click on the “subordinate taxa” tab. Sixteen of the species are native to California and two are non-native species commonly grown throughout the state. An example of a popular native species in Southern California is Mexican whorled milkweed (Asclepias fascicularis), which has narrow leaves and creamy pink blossoms. Milkweed flowers are shaped like stars. They’re tiny but make a big statement in gardens due to growing in clusters at the top of plant stems. While some types of Asclepias have pale flowers, others — such as the Southern California favorite non-native called tropical milkweed (A. curassavica) — bloom bright orange and gold. Many sources note that tropical milkweed is long blooming and particularly alluring to monarchs, so it does a great job of feeding them. However, in warm-winter climates it acts like an evergreen that is leafy all year round. The problem with this lushness is that the plant may encourage monarch butteflies to linger up north instead of migrating to winter grounds in Mexico. Scientific research indicates that it is best to keep the plant trimmed to the ground during winter to avoid this situation. Otherwise, it becomes a vector for the spread of a parasite called Ophryocystis elektroscirrha or OE due to heavy traffic from a large population of overwintering monarchs. Protective Toxins. Milkweeds contain chemicals called cardiac glycosides that are harmful to many animals. These substances don’t hurt the caterpillars of monarchs or their close relatives, the queen butterflies (Danaus gilippus) that also lay eggs on milkweed leaves. When the eggs hatch, the larvae eat the leaves and become toxic to many predators. Fake Milkweed Danger. The conservation organization Monarch Joint Venture notes that a European relative of milkweeds — black swallow-wort (Cynanchum louisea) — is dangerous to monarch butterflies. It is a plant you won’t find in garden centers and an invasive species in several states, including California. Butterflies identify plants by look, smell, and taste. Unfortunately, black swallow-wort — which has clusters of tiny, deep purple, star-shaped flowers — fools monarch mothers into thinking it is a milkweed. But their babies starve, because they can’t feed on its leaves. So, weed these invaders no matter how pretty they are. Before further discussing foods that monarchs favor, it’s necessary to note that Green Thumb has a number of garden centers, and not all will have every plant we mention in an article on hand at the same time. Many flowering annuals, perennials, shrubs, and trees at our five Southern California garden centers are nectar sources for butterflies and moths. But sometimes the availability of plants we mention in our blog vary by center, or stock runs out. Please forgive us if this is ever the case. We’ll do our best to let you know if, when, and where the plants you want are available. In addition to milkweeds, monarch butterflies love the nectar of flowers ranging from American natives, such as Agastache (commonly called hyssop), to nonnatives like Zinnia. In-between that A to Z range, you’ll find low-water California natives, including light purple-flowered favorites like Cleveland sage (Salvia clevelandii) and California lilac (one of 56 Ceanothus shrubs native to our state). Butterfly favorites come in a broad range of colors, but yellows and golds make especially pretty companions with purple flowers. Two examples of California natives that monarchs favor are lanceleaf tickseed (Coreopsis) and goldenrod (Solidago). Although the sap of milkweeds makes monarchs unpalatable or even dangerous to many creatures, some attackers have adapted to the toxins. Becoming aware of these seemingly invincible enemies may help you to minimize their presence in the garden by (1) spreading out plantings of milkweed throughout your yard to minimize concentrations of attackers, (2) avoiding the purchase of biocontrol insects known to attack monarch butterflies, and, in some cases (3) removing the villains by hand (be sure to wear gloves) or with a butterfly net. Predators, such as carnivorous beetles, birds, lacewing larvae, lizards, mantids (praying mantis is one), and spiders. Parasites, such as fungal and bacterial pathogens that infect hosts and can’t live away from them. Parasitoids, which are tiny creatures such as certain kinds of tachinid flies and wasps, that lay their eggs on or in other insects’ bodies. Here is a helpful article from the University of Minnesota’s Monarch Lab describing the main natural enemies monarch butterflies face. Many are considered beneficial in gardens, because they minimize infestations of pests — such as spider mites and aphids — that kill flowering plants. Trying to eliminate beneficials from your garden could unbalance your backyard ecosystem. Two beneficial insects that may spook human observers the most are tachinid flies and mantids, which are valued for biological control of insects that harm crops. But they become pests themselves when they kill monarch young. Out of about 10,000 species, 12 types of tachinids attack monarch butterflies. Tachinids insert their eggs into caterpillars where they live and feed until ready to pupate. They exit their host’s dead body on thin threads and go on to become flies and repeat the cycle. Unlike tachinids, a mantis immediately kills its prey by eating it and attacks a wide range of beneficial creatures as well as pests. Although they consume harmful insects, mantids eat too many beneficials — from hummingbirds to monarchs — for efficient, biocontrol targeting of pests. It’s possible to handpick larval tachinids by removing leaves on which they are laid. However, due to its large size, a praying mantis may be easier to catch either as an egg sack on a branch or wall or as an adult hanging out in its favorite hunting grounds — pollinator gardens. Nevertheless, a praying mantis or another kind of adult mantid may be hard to see at first, because they look like leaves until they leap. 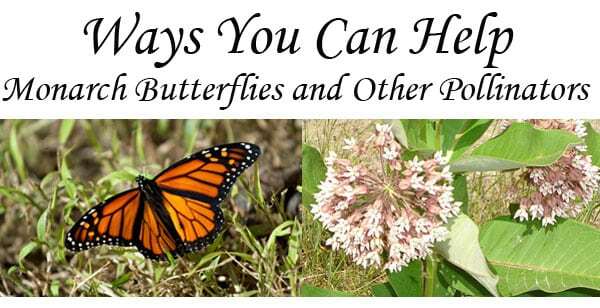 When you locate one, The Cornell Cooperative Extension of Oneida County suggests laying a butterfly net over or next to it and “gently” tapping it into the net. What comes next? The Extension service doesn’t say. But try not to retaliate even if you saw it chomp off the head of a beautiful monarch. Maybe you could put it in a shoebox with holes in the lid, collect a few more of its buddies, and deliver them someplace where there are no milkweeds. Chemicals that harm bad guys in the garden also harm the good guys, including monarch butterflies and other pollinators. One of the most important things you can do to protect monarch butterflies is to avoid applying pesticides and herbicides in your garden and landscape. If you absolutely must use some substance to get rid of an invasion, seek the gentlest agent possible, such as a soap spray. When visiting a Green Thumb Garden Center, ask questions about products and their application before purchase. You can also contact us by phone or online. We’ll help you make informed decisions about pollinator plants and pest solutions.